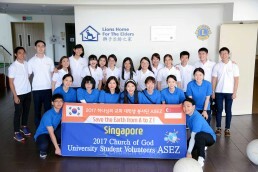 On July 16, 2017, 26 members of ASEZ visited Lions Home for the Elders to help the senior citizens spend pleasant summer this year; some of the members were from Korea to exchange cultural experiences and the others were from Wings of Love, a Church of God club at National University of Singapore [NUS]. They cleaned 950 fans, which were placed on each floor, to help the senior citizens live in cool environment even in the hot weather. They also had a meaningful time with the senior citizens, talking with them. The students from Korea and from Singapore, whose languages and cultures are different from each other, gathered together and did the voluntary service with one mind; they had time to learn each of their countries’ good cultures. The Singaporean students said it was great to be able to learn Koreans’ respect for the elderly and their way of greeting them, and the Korean students said they were able to learn Singaporeans’ kindness and respect for others. Kim Seong-uk from Daegu Catholic University of Korea said, “I’ve seen how active the voluntary service for nursing homes is in Singapore. I hope that voluntary service for nursing homes will be more active in Korea too, When I go back to Korea, I will continue to take part in ASEZ activities,” and expressed his plan for the future activities.